It was four years ago that my Dutch Oven adventure started. I even have a hard time remembering the scene, now. I seem to remember that it was June of 2006, father's day. We were living in the basement of my in-law's home at the time, waiting the many months for the completion of construction on our home. 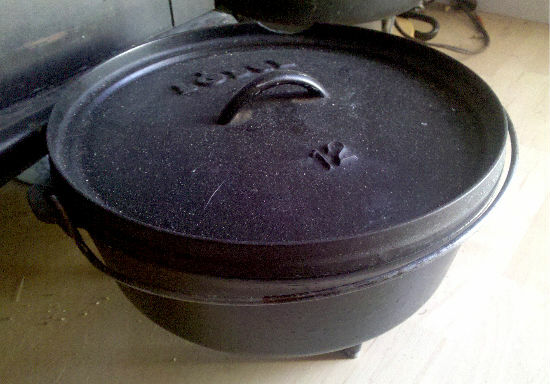 My wife bought me a Lodge 12" dutch oven and gave it to me. I don't remember how I seasoned it, but I got it done and started wondering what I was going to cook in it. I had pleasant memories of boy scout campouts and making pizza. So, I decided to try it. It was simple, and it worked, and I was encouraged by my first bits of success. My kids, of course, loved it, because it had pepperoni. I remember, I used one of those boxed pizza crust mixes, and a jar of Prego for the sauce. From there, I started cooking pretty much every sunday, and with few exceptions that has continued through today. It was nearly 8 months later that I began blogging my recipes. I don't see any of that changing in the near future, either. It's been wonderful. I've met a lot of new friends, and learned a lot of new skills. It's been a great ride. So, yesterday, I cooked up a feast. My wife was surprised. Why should I want to cook on Father's Day? See, she looks at cooking like a chore. I look at it like a break from my crazy week. 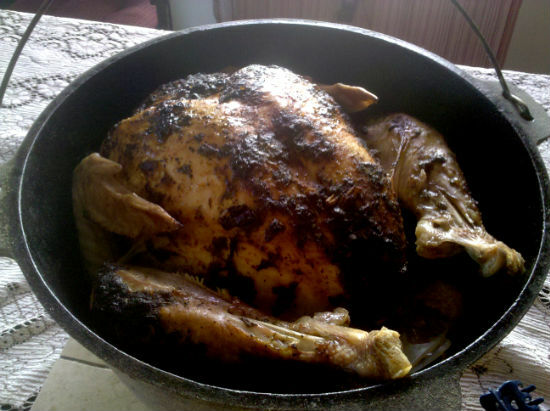 I started out thinking I would do a turkey, and do it with that southwestern spicy rub that I really liked. I thought, however, that this time I'd brine it first. So, the night before, I cleaned out one of our coolers, opened up the turkey, and put it in. Then I covered it up with cool water, and mixed in the salt and sugar. Actually, I mixed the salt and sugar in a separate bowl first, to make sure it dissolved right. I left that overnight to soak and to thaw. I thought I would do another no-knead bread, too, so I got the dough ready and set it out to ferment through the day. The next afternoon, after church, I got things started. After lighting up the coals and getting the turkey on to roast, I got the bread ready. I didn't really do anything fancy. I just followed the recipes as I wrote them! I did change up the bread in a couple of ways, however. Just after I put the dough into the hot dutch oven, I sprinkled the top with parmesan cheese. Lightly, mind, nothing too oppressive. Once those were cooking, I was just relaxing and keeping the coals on it. It was a kind of windy day, so I had to keep on top of the coals and keep adding more to the pile in order to keep heat on. But it wasn't a stressful cook at all. The bread took about an hour, and the turkey about three. 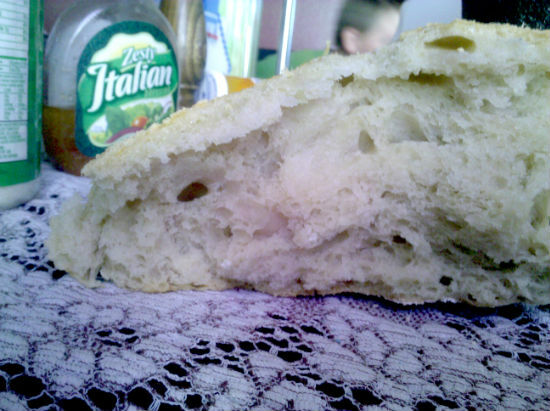 The Bread, by the way, turned out phenomenal. I finally got a soft crust, with big bubble holes in the crumb! I was so thrilled with myself. As the turkey was nearing done, I got to thinking about what to serve as a veggie. 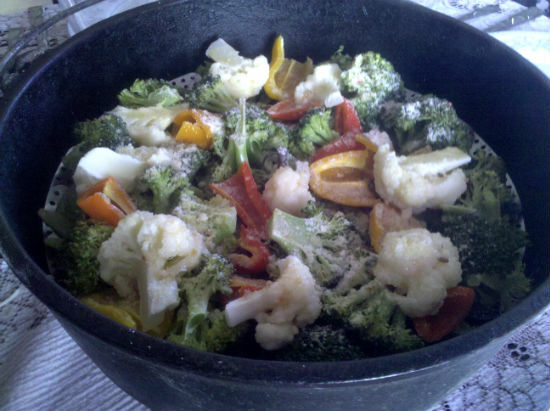 I thought about Potatoes, and then I suddenly got this idea to do an oven full of steamed mixed veggies. I Cut a bunch of veggies of various kinds and colors into bite-size bits. I used snow peas, broccoli, red and yellow sweet peppers, and cauliflower. I put them on one of those metal, fold-out steamer things, like I did with the corn a few weeks ago, and put in a few cups of water. That went out on the coals. When they were done, about 45 minutes later, I poured some italian dressing over them and sprinkled on some more parmesan cheese. They were delicious and elegant. At that point, I knew this was more than just a dinner, but a real treat, so I got out our nice dishes and we all sat down. Turkey, veggies, and bread. What a feast! A great way to celebrate Father's Day, and a special Dutch Ovening Anniversary!